Citation: Mahmoud AF. IMLAD is not a contraindication for OPCAB. Ann Cardiovasc Thorac Surg 2018;1(2):41-43. • LIMA: Left internal mammary artery. • LAD: Left anterior descending artery. • CABG: Coronary artery bypass grafting. • USA: United States of America. The first internal mammary artery used in cardiac surgery for treatment of ischemic heart diseases in humans was proposed by Arthur Vineburg in 1945 by intra-myocardial implantation not vascular anastomosis. Demikhov was the first to describe LIMA anastomosis to LAD in dogs in 1952. Gordon Murray, Sabiston and Goetz described its use in humans almost at the same time. The first to guide surgeons to the standard LIMA to coronaries (circumflex artery) was Vasilii Kolesov in 1964; it was off-pump. In the USA; LIMA to LAD was performed at the same year but onpump [1-4]. The comparison between the OPCAB and the on-pump CABG is endless. No doubt the OPCAB has many advantages over the on-pump in elderly, renal and/or liver impairment, peripheral vascular diseases, porcelain aorta, coagulation disorders recent strokes and even recent MI [5,6]. Being a well addressed technique over almost 5 decades; the OPCAB represents 15-20% (world-wide) to 60% (in Japan) of the performed CABG procedures performed . The intra-myocardial LAD is totally different from the myocardial bridging despite some authors do not discriminate sharply between both categories. The bridge in most cases is a limited length of the LAD covered by muscle fibers that squeeze the LAD in systole meanwhile the muscle fibers of the intra-myocardial LAD just cover it without significant dynamic closure. The covered part of the LAD in some cases is not atherosclerotic [7-10]. The LAD may be embedded in the epicardial fat and it is just covered by variable thickness of fat or might be covered with transverse (perpendicular) myocardial fibers for variable distances of its length or depth. This might hinder some surgeons to identify the most important target in the CABG procedure; the LAD [8-10]. The incidence of the IMLAD is between about 15% to about 19%. In most cases there is an angulation between the superficial and the IMLAD parts. The most common variety is the middle part IMLAD (45-60%) [7,11,12], while it is a total IMLAD in about 22% of cases . The IMLAD is considered a surgical challenge if it is deep in its mid segment or anatomically the third part of the LAD. This is the part in which most anastomoses are performed in Figure 1 . 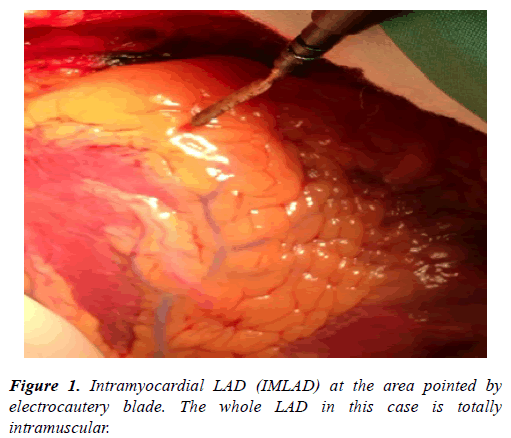 Figure 1: Intramyocardial LAD (IMLAD) at the area pointed by electrocautery blade. The whole LAD in this case is totally intramuscular. In such cases the LAD is followed by starting to dissect its proximal part before it dips inside the myocardium (Figure 2). Figure 2: Applying the octopus directly over the desired area and starting antegrade exposure. The distal part of LAD usually near the apex is dissected and proceed proximal. In cases that has no obvious LAD along its whole course. Start the dissection from a clear diagonal, proceeding proximally. The challenges in OPCAB, IMLAD exposure and anastomosis is not little. In OPCAB, it is feasible to perform good exposure and good anastomosis without exhausting the heart with extra doses of cardioplegia as in on-pump. Early and well obvious detection of ventricular injuries during dissection is better visualized and controlled in OPCAB. The procedure depends on the stability of the hemodynamics while fixing the heart by the cardiac stabilizer preferably the Medtronic Octopus due to malleability of its feet. The hemodynamics is less affected compared to other targets such as the Ramus or the Diagonals. The Octopus must be applied to the target area. Dissection is carried out using 15 blade and electrocautery with minimal power of 10 joules. The overlying fat is the main obstacle as it is friable and not easily retractable. The fat may be sprayed away by the eye-lid retractor. Careful manipulation during fat dissection and LAD anastomosis must be considered to avoid coronary fat emboli. The overlying veins could be controlled by liga clips or electrocautery. The muscle fibers are dissected by blade 15. Ball-tipped obtuse angled Potts scissor might be used for dissection of the overlying muscle fibers. If the area targeted failed to give a well exposed LAD; the Octopus might be transferred to search and dig in another area. There is no time limit for searching for IMLAD in OPCAB provided the diagonal branches are not jeopardized by the feet of the octopus. Once the IMLAD is well shown, dissection must be performed to a good distance to allow good lay down of the LAD without kink (comfortable accommodation of the LIMA in the created groove). The feet of the Octopus may be widened to give more space to work. The eye-lid retractor sometimes applied after or before positioning of the Octopus. In some cases, traction prolene 6/0 stitches might be used. The rubber stitch used for proximal or distal LAD control is of great value as it brings the LAD out of its native place for a considerable distance enabling better exposure and anastomosis (Figure 3). The traction of the LAD by the rubber stitch must be away from the area of anastomosis to avoid stretching and closure of the arteriotomy. 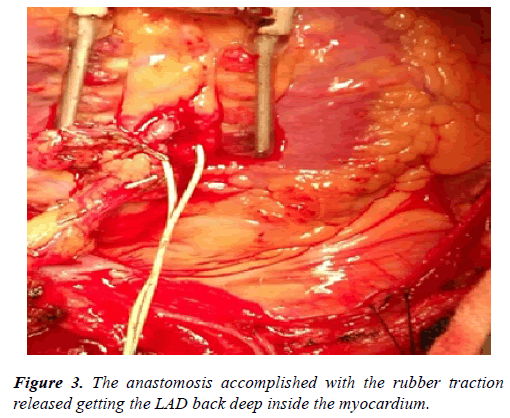 Figure 3: The anastomosis accomplished with the rubber traction released getting the LAD back deep inside the myocardium. Marsupialization sometimes is required to avoid retraction and fibrosis over the anastomosis. Generally, the deeper the LAD the longer the dissected area to accommodate the LIMA . There are no contraindications or limitations for the OPCAB in cases of IMLAD . The age, low EF, recent MI, organ or system impairment, all is not absolute contraindications. If there is an associated pathology (ventricular aneurysm or valve affection for repair or replacement) the heart lung machine is used . The point of criticism of the ventricular injury during dissection or after applying the rubber stitch was simply solved by pressure after stitch removal using the Octopus or manually applying a small gauze for few minutes. Gentle epicardial approximating prolene (6/0 or 7/0) at the jet area is another solution by just approximating both edges of the dissected groove. Topical use of hemostatic agents such as TachoSeal fibrin sealant patch was of value . In some varieties of the IMLAD there is one rare anatomical variety which is the diagonal and septal LAD. In such cases, the LAD early divides into almost two equal branches. The first branch runs at the edge of the inter-ventricular septum and is called septal LAD. This branch could be exposed and anastomosed after very deep and proximal dissection. The second sometimes is smaller and is called diagonal LAD. It lies in a site in-between the diagonal and the LAD but never reaches to the apex . In uncommon situations, some surgeons might perform distal LAD arteriotomy probing it then open proximally. This procedure is not safe and it lacks the safety for long probing leading to intimal injuries or/and distal stenosis after LAD puncture closure [11-15]. The ultrasound detection or the use of Cineangiography intraoperatively to locate the IMLAD is not practical [7,11,13-15]. The only contraindication of OPCAB in IMLAD which necessitate conversion to On-pump is intractable arrhythmias, severe hemodynamic disturbances or ventricular injuries [7,11-15]. In OPCAB whether it is superficial or IMLAD, the outcome is almost the same even in left main cases . In the intra-myocardial LAD there are two obstacles: the first is the identification of the LAD. The IMLAD in some cases may be totally covered and in such cases the personal experience of the surgeon is the most important to locate it. Diodato M, Chedrawy EG. Coronary artery by-pass surgery: the past, present and future of myocardial revascularization. Surg Res Pract. 2014;2014:726158. Buxton BF, Galvin SD. The history of arterial revascularization: from Kolesov to Tector and beyond. Ann Cardiothorac Surg. 2013;2(4):419-26. Katrapati P, George JC. Vineberg operation: a successful case 35 years later. Ann Thorac Surg 2008;86:1676-7. Dallan LA, Gowdak LH, Lisboa LA, et al. Modification of an old procedure (Vineberg) in the stem cell era: a new strategy? Arq Bras Cardiol 2009;93:e79-81. Taggart DB. Off-pump coronary artery bypass grafting (OPCABG)- a ‘personal’ European perspective. J Thorac Dis. 2016;8(Suppl 10):S829-31. Falk V. Stay Off-pump and do not touch the aorta. Eur Heart J. 2010;31(3):278-80. Mahmoud AF. Intra-myocardial LAD:Is it a contra-indication for off-pump coronary artery bypass grafting? J Egyptian soc cardiothorac surg. 2018;26(1):6-18. Angelini P. Normal and anomalous coronary arteries: definitions and classifications. AHJ. 1989;117(2):418-34. David M, Fiss DM. Normal coronary artery anatomy and anomalousvariations. Appl Radiol. 2007;36:14-26. Ishimori T, Raizner AE, Chahine RA, et al. Myocardial bridges in man:clinical correlations and angiographic accentuation with nitroglycerin. Cathet Cardiovasc Diagn 1977;3:59-65. Olearchyk AS. Intramyocardial coronary arteries: dissection during coronary artery bypass surgery in 70 patients. Vasc Surg. 1992;26:649-55. Ziadinov E, Al Sabti H. Localizing intramyocardial left anterior descending artery during coronary bypass surgery: literature review. J Cardiothorac Surg. 2013;8:202-06. Apostolakis E, Koletsis E, Leivaditis V, et al. A safe technique of exposing of a "hidden" left anterior descending artery. J Card Surg. 2007;22(6):505-06. Parachuri RV, Chattuparambil B, Hasabettu PK, et al. Marsupialization of intramyocardial left anterior descending artery: a novel approach for easy access during revascularization. Ann Thorac Surg. 2005;80(6):2390-92. Olearchyk AS, Nayar AP. Use of a handheld epicardial ultrasonic Doppler flow detector to locate an intramyocardial coronary artery encased in inflamed neoplastic pericardium. Tex Heart Inst J. 2004;31(4):425-28.